LOL! I’ve seen this! And I almost included something about it in the post, but I didn’t. Too funny. Thanks for sharing that. Love your Paranormal Wisconsin posts, although now I never want to drive your area at night! He was probably just looking for The Joker! Actually, in the photo he resembles the infamous Mothman from Pleasant Point, West Virginia. Maybe there’s a club. There’s also been a sighting of a Lizard Man. He lives near the Mississippi. Reminds me of The Mothman, as Mark said above. Wild stuff. Ooh, great tale. 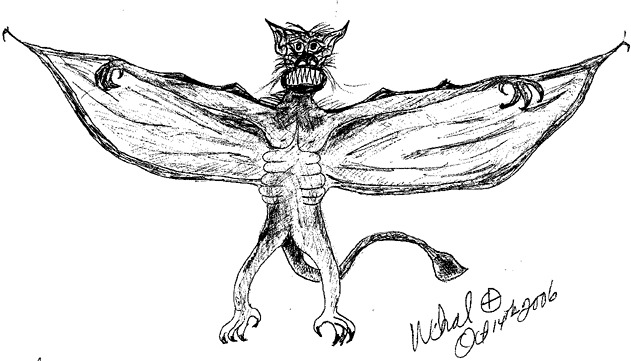 As well as the Mothman stories, it also reminds me of the Latin American Chupacabra, which doesn’t have wings but does drain the blood of cattle. I thought bat man as in the comic book superhero. This one is scarier. Your Paranormal Wisconsin series must be popular with the Wisconsin tourism board. At first I thought these would make me less likely to go to Wisconsin, but I’m increasingly intrigued. Yah, I don’t know why I’m not included on any brochures yet. Please write a letter on my behalf. What a durn cool blog. I love this kind of stuff. Now, is the werewolf/Indian Mounds thing the Bray Road beast or is that something else all together? Yes it is!!! Check out the previous post on Paranormal Wisconsin, all about your beastie from Bray Rd.! I know this is an old post but hopefully someone will see this. I recently hiked Trempealeau Mt. because my boss told me there were some indian mounds there and it would be a cool spot. Then I read this story (http://mothmanchronicles.blogspot.com/2010/09/mothman-contact-at-trempealeau-mountain.html?showComment=1440394333022#c729458803367378490) about a Mothman nest there. For those who don’t know the Mt. is only about 20 minutes away from briggs rd. This makes the story about correlations of werewolves and mounds very interesting, you could almost make the case for mothmen now. I am a pretty firm nonbeliever in the paranormal, but this is too much fun. Definitely going back. I’ve heard about the mothman. We’ve supposedly got a Lizard Man and Batman around here too.